Since it first went online in 1995, Amazon has grown to become the largest online retailer in the world. Amazon.co.uk provides fast, convenient online shopping for Amazon’s customers in the UK and Ireland. Amazon.co.uk and offers millions of new, refurbished and used items in categories such as Books, Movies, Music & Games, Digital Downloads, Electronics & Computers, Home & Garden, Toys, Kids & Baby, Grocery, Apparel, Shoes & Jewellery, Health & Beauty, Sports & Outdoors Tools, Auto & Industrial - from around the globe. How it Works: Use this gift voucher on AllGifts.ie to order Amazon Voucher Codes for use on Amazon.co.uk. Or you can swap this voucher for any other gift or voucher listed on AllGifts.ie. Amazon.co.uk Voucher Codes are sent by email once ordered, normally within 3 working days. 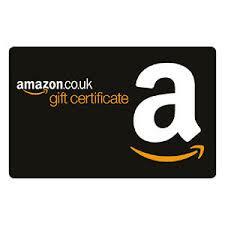 Amazon.co.uk vouchers are available in denominations of £5. (e.g. £5, £10, £15, £20 etc) Minimum voucher value is £5. Since starting in Seattle in 1995, Amazon has grown to become the largest online retailer in the world. Amazon.co.uk was launched in 1998, and offers millions of new, refurbished and used items in categories such as Books, Movies, Music & Games, Digital Downloads, Electronics & Computers, Home & Garden, Toys, Kids & Baby, Grocery, Apparel, Shoes & Jewellery, Health & Beauty, Sports & Outdoors Tools, Auto & Industrial - from around the globe. Amazon.co.uk features include personalized recommendations, wish lists, and 1-click shopping. If you are keen to sell your own items, Amazon also offers Amazon Marketplace which enables you to sell new, used, collectable and refurbished items alongside their new ones. Listing your items on Marketplace makes them accessible to millions of Amazon customers. Amazon.co.uk Voucher Codes are sent by email, normally within 3 working days.